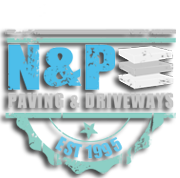 N & P Paving is committed to ensuring that your privacy is protected. Should we ask you to provide certain information by which you can be identified when using this website, then you can be assured that it will only be used in accordance with this privacy statement. We also use social media buttons and/or plugins on this site that allow you to connect with your social network in various ways. For these to work the following social media sites including; google, twitter, facebook, linkedin, will set cookies through our site which may be used to enhance your profile on their site or contribute to the data they hold for various purposes outlined in their respective privacy policies. Facebook Some of our pages use Facebook sharing buttons or fan boxes. Facebook may set a number of cookies to store your login state, preferences or other information. Google Analytics We use a website analytics service called Google Analytics to help us see how customers are using our website, what they like and how improvements can be made. Google Maps Some of our pages include interactive maps provided by Google. Google may set cookies to store information and preferences about maps or other associated Google services where we embed Google maps.